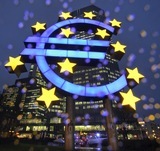 Why Are Banks Ditching Foreclosed Homes, and What’s the Euro Worth? 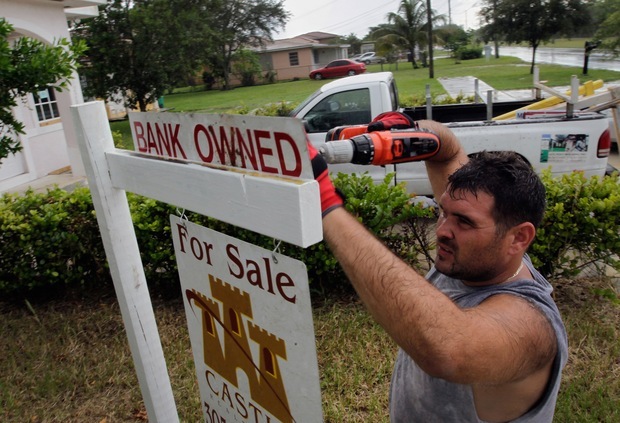 Renzo Salazar places a sign in front of a foreclosed home in Miami. Photo by Joe Raedle/Getty Images. Question One: Recently on the show “60 Minutes,” they showed how banks are walking away from foreclosures. They could, instead, be reducing people’s principal when their house value goes down. Are the banks instead getting rid of houses so they can write it off as a different kind of loss than reducing principal, or because they need to stimulate the housing market by creating more demand, when the old housing is all bulldozed? Question Two: If Europe is doing so bad, why does my $100 get me €77? A huge difference? Paul Solman: First of all, with regard to your first question, Barb, see our NewsHour story on the same story last summer — Raze the Roof — situated in the same city “60 Minutes” featured, Cleveland. 1) From my own reporting, it seems that about 75 percent of homes with mortgages are held not by banks, but by pools of investors and Fannie/Freddie. The banks generally “service” the loans: collecting the money, etc. But they’re not on the hook for any losses. If they reduce the principal, though, the investors can theoretically come after them legally. So it’s easier to let the properties rot. 2) Reducing principal sets a “bad precedent.” Since banks do hold the other very roughly 25 percent of mortgages (if my estimate is correct), they might be flooded with appeals for mortgage reduction were they to make renegotiation easy.